Wow! Block time again! This block is the only thing I have sewn in over a week. Sad! I'm glad this block got me into the sewing room for a few minutes! 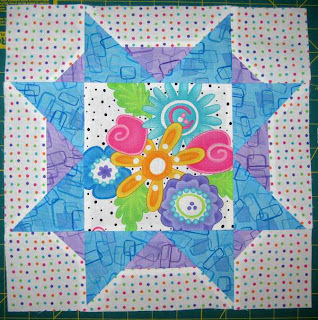 Today's block is from Michele Foster of the Quilting Gallery. Thanks so much to Konda for organizing this super fun quilt-along. 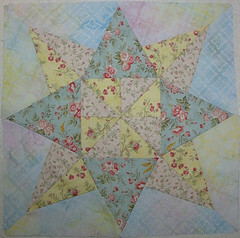 I’ve loved seeing all of the star blocks the designers have come up with and the blocks being made in the Flickr group too. I’m Michele Foster and I own and manage the web site, Quilting Gallery [http://quiltinggallery.com/]. My site is dedicated to bringing quilters together from around the world and inspiring quilters' creativity. I started quilting many years ago, but took a long hiatus (10 or so years) to start my own business, move to another city (Ottawa, Ontario) and explore other crafting projects (I love to crochet too!). One Friday afternoon in December 2007 at the local pub, a group of fellow web developing geeks and I were sitting around chatting when the question was raised, "If you could do anything you wanted, what would be your dream job?" My response, the same as it had been for the last 15+ years, was, "Open a quilt store!" 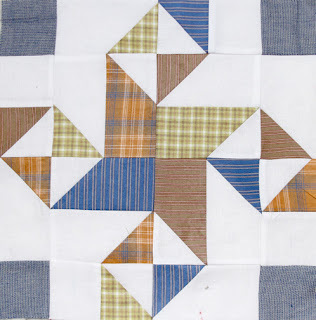 Of course, my friends around the table didn’t really understand my answer, but it was that afternoon chat that prompted me to start the Quilting Gallery site and re-introduce quilting back into my life. Four years later, I’ve never been happier to have quilting be a huge part of my everyday life. 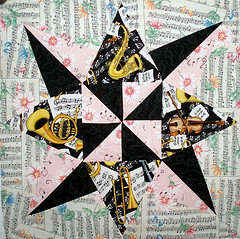 My site includes the quilting bloggers directory, quilt shop locator, quilter's market and the quilt guilds directory. 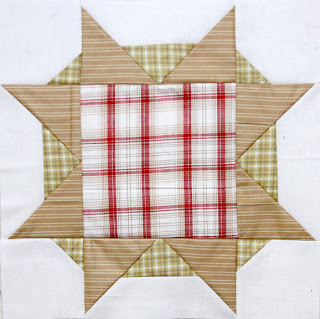 I host swaps, weekly quilt contests, challenges, guest bloggers and quilt-alongs too. I also have a brand new section starting in February called the Learning Center hosted by Pat Sloan [http://blog.patsloan.com/]. We’ll be tackling Storage and Organization for the first month. 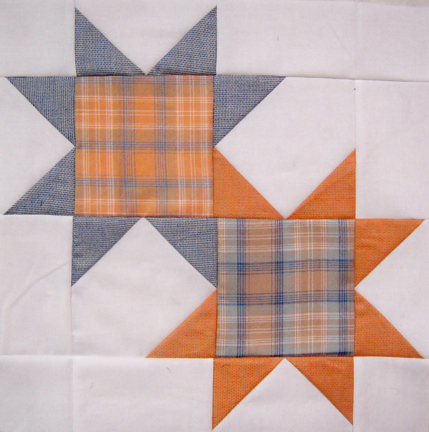 The fabric I used for my star block was left over from a fat quarter bundle used to make my Happy Memories quilt [http://quiltinggallery.com/2011/07/28/happy-memories-a-quilt-for-me/] in honour of my three kitties that are now on the other side of the Rainbow Bridge. It seemed fitting to use that fabric and then name the block after my new baby! Drop by the Quilting Gallery [http://quiltinggallery.com/] or become a friend on Facebook [https://www.facebook.com/michele.foster] or Twitter [https://twitter.com/#!/MishkaOttawa] to follow my quilting journey and Milo’s antics. Here's Michele's block called Milo's Star. Here's my version of Michele's block. 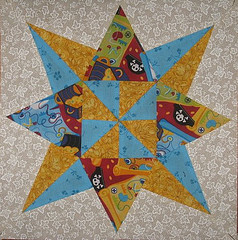 It's a fun variation of an eight pointed star. The center of the star has a nice place for fussy cutting. Click HERE for the link to the instructions. The drawing will be from the flickr group. The drawing tonight (first thing in the morning really) is for any blocks posted since my last block was posted. The drawing is technically for block 9, but any blocks posted will be in the drawing. There will be some of you who are quick and will get your blocks posted. This block is "due" in two weeks. I say due, but it really doesn't matter. 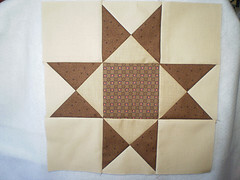 Post your block when you get it done, and it will be entered into the next drawing. If you make one block, post one picture. If you make two blocks, post two pictures. What's up for grabs this time? Michele is giving away four copies of both of the Quilter’s Cookbooks [http://quiltinggallery.com/quilters-cookbook/] that she’s organized and published as PDF documents. They include family-favourite recipes, quilts and heart-warming stories from quilters around the world. 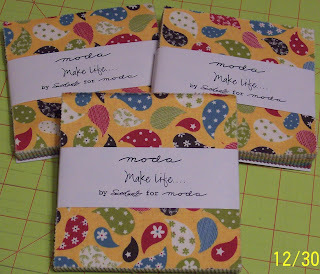 I will also have a quilt book to give away! Winner time again! I am so impressed with the gorgeous stars in the flickr group! and Betty C in Oregon! Congratulations! Send me your information and Jovita and I will get those out to you! The short of it is I'm a Washington (state! vs DC) girl married to a tall German living in Belgium. I own a very little quilt shop and love to teach and design. When I'm not doing that I keep very busy - making all kinds of things, cooking, baking, reading, knitting, gardening and getting inspired (my latest addiction is Pinterest > http://pinterest.com/peawink/). Right around the time we were signing up to design for Konda's Fat Quart Quilt Along I found out I was pregnant ... and boy, oh boy, the combination of the two. New ideas, hormones, stars, new ideas, more hormones - you get the picture right ? ... I couldn't sleep! So I got up and sketched about 20 different stars to share with you. But you only needed one! So I had to narrow it down. Then I found out we were having twins so I settled on this one and I really hope you like it. My sketchbook includes more variations and more ideas and more stars .. yikes - so many that I'll be posting a pattern a month on my blog in case you want more stars to make your quilt *even bigger*. So if you want to know more about me .. browse through my blog .. there's a lot there and I'll admit it's been a bit hit and miss over the years while we got to this pregnant state. But 2012 looks to be a pretty wild ride ... I've finished 3 things just this week that I need to blog about ... oh yeh, and started another 100 (cheeky grin - those who know me best know this is at least half true). I might be full of "baby" things at the moment but maybe that's helping the whole creativity thing ... my mind is spilling over. Stop by and see what's in the works. Here's Jovita's block called Make Mine a Double. Here's my version of Jovita's block. As much as I love the double star block, I'll keep my wishes for "making mine a double" to stars and ice cream not babies! My hats off to parent's who have more than one baby at a time! **Forgot to mention that my stars ended up intertwining differently than Jovita's. Both ways work. I used the pictures on the bottom of her instructions. Your's may turn out like mine or hers. Don't unpick! Both are great! The drawing will be from the flickr group. The drawing tonight (first thing in the morning really) is for any blocks posted since my last block was posted. The drawing is technically for block 8, but any blocks posted will be in the drawing. There will be some of you who are quick and will get your blocks posted. Jovita has donated a Jacquard Ribbon Needle Case kit for one lucky winner! Did you catch that she lives in Belgium? She mentioned something to me about chocolate. There may or may not be some Belgium chocolate included for the winner. I want to win! 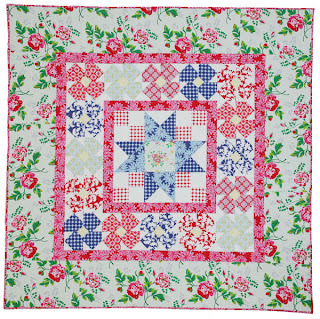 I just saw online that you can get a kit for the Carnaby Street quilt that was in McCall's if you are interested. This fabric, England Swings by Timeless Treasures, was really fun to work with. In fact, I have designed another quilt - completely different - using it that will be a free pattern on Timeless Treasures' website one of these days. I will let you know! I love how April adds little touches of embroidery to give her blocks personality. But it is that embroidery that causes me stress. I even recently tried it again to see if it was as challenging as I thought. Suffice it to say that there was much weeping and wailing and gnashing of teeth. Okay, maybe just a lot of grumbling. I will try it again in a few years, but not today. It doesn't look like there is a lot of embroidery, so if you have a better relationship with it than I do then you should do her block of the month! Check it out and see if you like it! 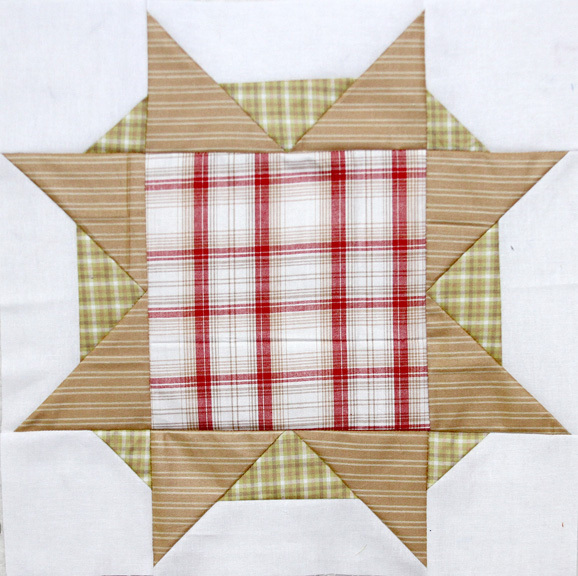 The day after Christmas, the Temecula Quilt Co started a twelve days of Christmas quilt. One block a day for 12 days -- 3 1/2" blocks because that's their favorite size block. Here's the link to the last post. It goes backwards from there. It started out so easy. Block 1 was a 3 1/2" square. Block 2 was a half square triangle. 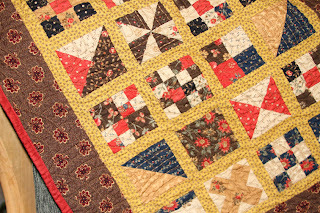 The miniature quilts they do always look so fun. When it looked like there wouldn't be applique, I decided to do it. The fabric I chose was a Collection for a Cause charm pack from Moda. It wasn't until they asked if we had figured it out that I realized that there was something to figure out. Day 1 was a block with 1 piece, day 2 had 2 pieces, all the way up until the twelfth day of Christmas that was a block with 12 pieces. It worried me a little, so I decided to play it by ear. Along the way, a couple of the blocks had enough pieces cut to make two blocks, so I just made them both. Then I loved the 9 patch so I cut the scraps to size to make more 9 patches. I made three extra. The tenth day was my favorite block, the four patch in a four patch, so I decided I had to make a 16 patch. By the time I was done I had 20 blocks. Perfect! The finished size is about 22" x 26." Now that it's done, I feel like I should have switched the 1 patch with the 16 patch, but I didn't catch that before. 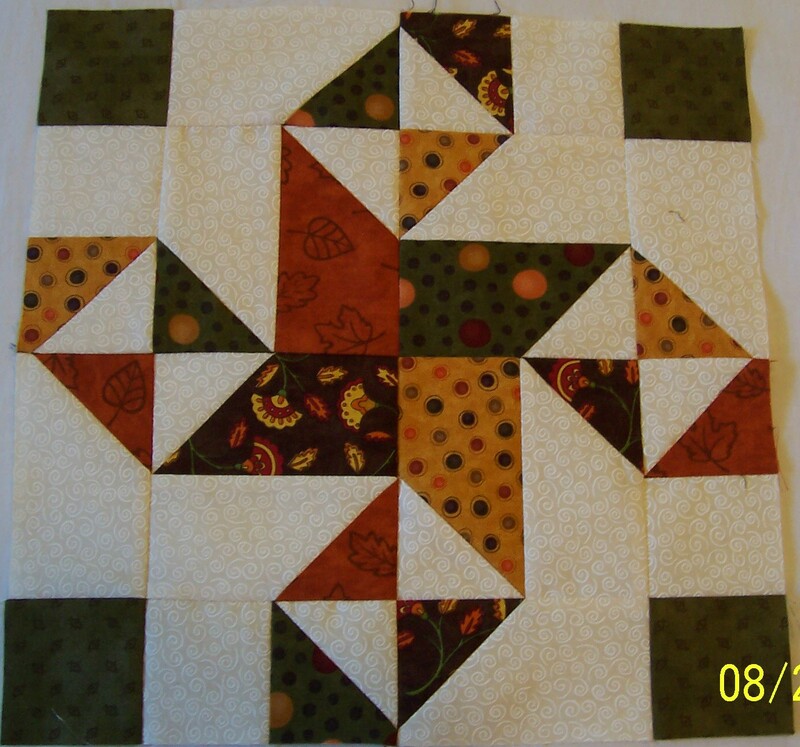 I thought the plain block would stick out, but I think the red and tan hourglass sticks out the most. That wasn't one of the blocks. That was the left over from the third day. I had to hurry and finish it because I had a quilting design that I was anxious to try. Here's a close up of the quiling. It's called the Baptist Fan. It is an old pattern. It is my understanding that it was a popular pattern for hand quilting because it didn't need to be marked. 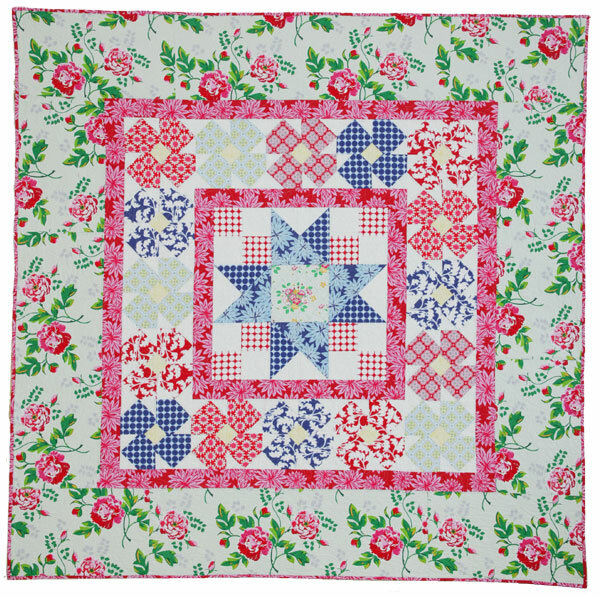 The point of the fan was where the quilter's wrist would be. The stitching was in the path of the wrist moving. If that makes sense. I like the design a lot. I recently bought the pattern for my Statler. I love how it turned out! 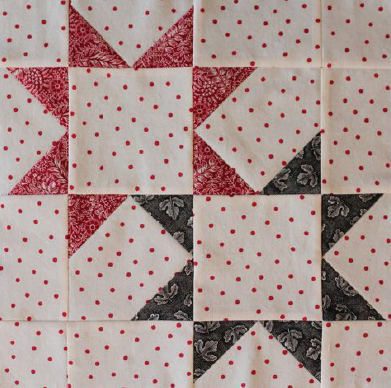 To bind the quilt, I wanted to be brave, so I went with red. I had a rust brown fabric that I wanted to use. It would have looked good, but the red is striking. I'm glad I was brave. I used a 1 1/2" single thickness binding. While the single thickness is nice and flat, I don't think that the thickness of a double fold binding bothers me. I think I will stick with the double fold. I thought miniature quilts would be too fiddly for me, but I actually like them now. What do you think about Minis? 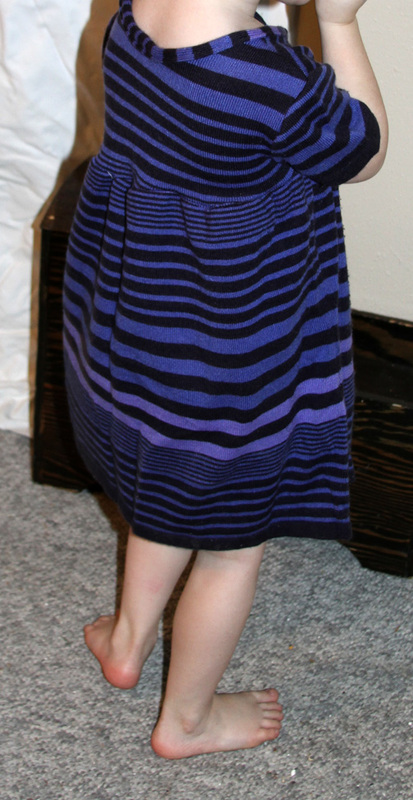 A month or so ago a couple things I had been wanting to do collided, and my almost 4 year old ended up with a super comfy sweater dress that she loves! 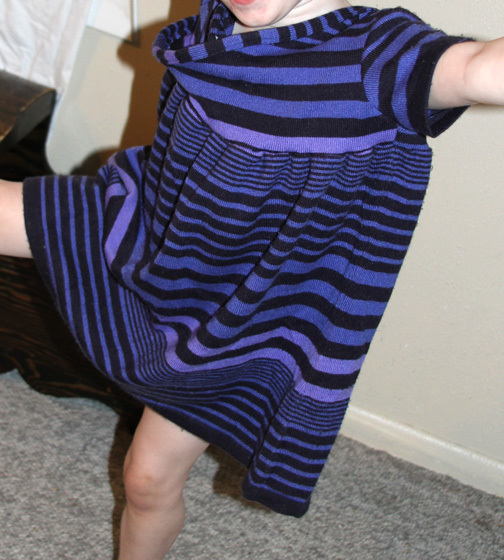 I have been looking for a sweater dress for her and her younger sister for a while. The problem was that they didn't need another dress, so I couldn't justify spending much for one. The second thing that happened was that I saw this tutorial on Sew Mama Sew for a Summer Pillowcase Nightgown. I have several pillowcases with decorative edges from my mother-in-law who is deceased. I have been trying to figure out how to make a quilt out of them, but now I think I will make a special nightgown for my girls. I bought a couple pillowcases at the thrift shop to test, but I haven't yet. The ideas collided, and I decided to use the pattern to make a sweater dress from a soft sweater I picked up at a thrift store. The sweater was a large women's sweater, but it wasn't too long. I actually was able to cut the bodice and the sleeves from the sleeves of the sweater. 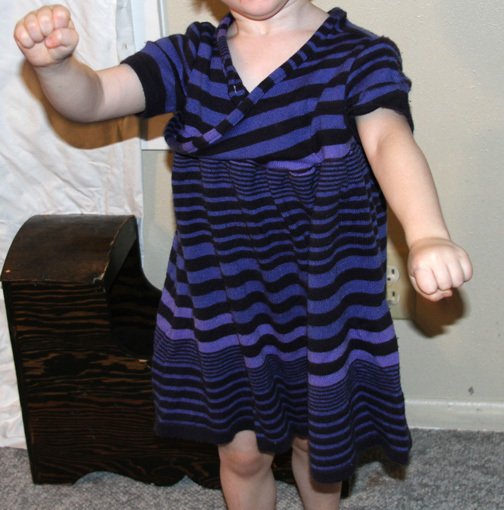 The length of the dress is the length of the sweater from the armpits. I was hoping that it would end up fitting the 2 year old, but the 3-4 bodice was perfect for my almost 4 year old. So it's a hair shorter than I wanted. Also, the length was shorter than the pattern said because it was what I had to work with. I also didn't add the bias tape around the middle. I put the seam on the inside. It isn't a big deal. You have probably noticed that the bodice gapes a little. I'm sure that has to do with the material that I was working with. I have put a few stitches under the right arm that has fixed that. I loved the pattern, and I look forward to trying it out with a pillowcase! An odd thing happened to me this week. On Monday (no school) I took my two older kids running (just a couple miles). We ran a route that we often run. Part of it is an a dirt road where cars aren't suppose to be so people often go walking or running there. My daughter, young and fast, was ahead of us, and I sw that she had stopped to talk to someone. It looked like it could have been one of her friends. When I got there, my daughter had already taken off running again, and I saw that it was a lady I didn't know. She stopped me and said I looked familiar as was trying to figure out where whe knew me from. Then she says, "I know this may seem odd, but do you have any children who want to take piano or violin lessons?" Although I was half wondering who this crazy lady was who was asking if I wanted her to give my children music lessons, I actually said yes! For at least a year, I have wanted to have one of my middle girls take piano lessons. I really wanted it to be somewhere that she could walk. My next door neighbor use to teach piano lessons, but she passed away suddenly. We still miss her. Turns out, that this new lady is within walking distance, teaches piano to one of my neighbor's three children, my daughter has taken her first lesson, and my daughter loved it! Lessons: 1) Sometimes it's okay to go out on a limb and ask a question that sounds crazy. 2) Sometimes it's good to jump on an opportunity that is presented. 3) When a daughter needs piano lessons, just get her in piano lessons already! Enough with the story, we have winners! Congratulations! Send me your info (kluckau@moosequilts.com), and we will get those right out to you! I am a stay at home mom who was educated as a high school math teacher. I find it interesting how many math teachers are also quilters. About 5 years ago I found myself with most of my children raised and lots of time on my hands. I read many books, but when the day was over, I didn’t have anything to show for the time I had spent. I wanted to do something more productive. My thoughts turned to quilting. I loved quilts and decided to spend my extra time quilting. 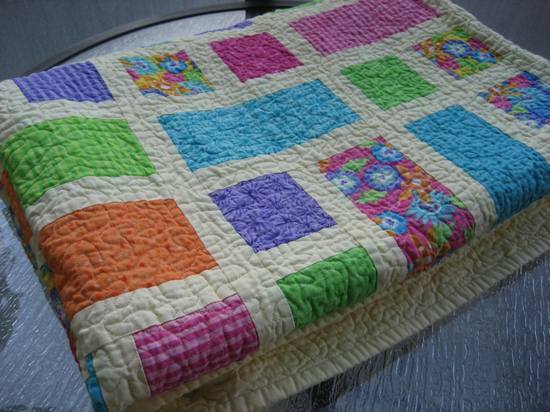 I had made quilts all my life, but they were mostly cheater cloth that I hand quilted and mostly it was helping other people quilt their quilts. My quilting life changed when I bought a rotary cutter and mat. 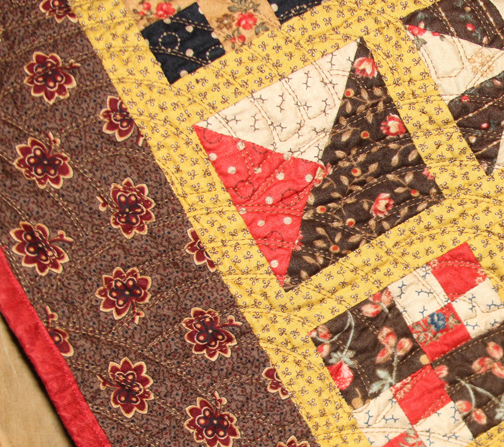 My beginning education came from attending a quilt retreat. I have attended that quilt retreat for four years now. 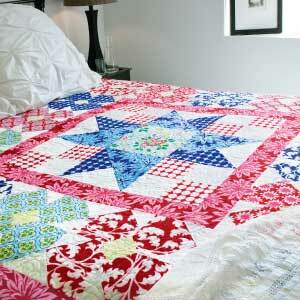 Every quilt I make has been influenced in some way by that retreat. I also joined a quilting club - the Steeple Rock Stitchers. They are a wonderful group of women that have shared this quilting journey with me. The Internet has been my “Quilting College.” I have studied and read everything I can get my hands on. 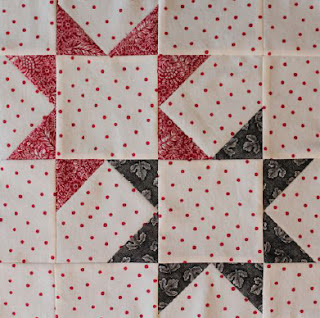 There are so many helpful bloggers and sites to teach you everything you need to know about quilting. There are also many wonderful books. As I have studied and read, my quilting knowledge has grown. It has been an amazing journey. One of the things I have become especially interested in is quilting on my domestic machine. I do my own custom quilting. This has been very satisfying to me. I have also made an extensive study of color in quilts. I am getting better at selecting fabrics in colors that go together. Quilting has taken over my life. I spend every free minute quilting, reading about quilting or talking about quilting. Now when the day is over, I can look at my stack of quilts and see I have done something with my time. The opportunity to be a designer for this quilt along adds a new dimension to my quilting experience. I hope you enjoy making this block. 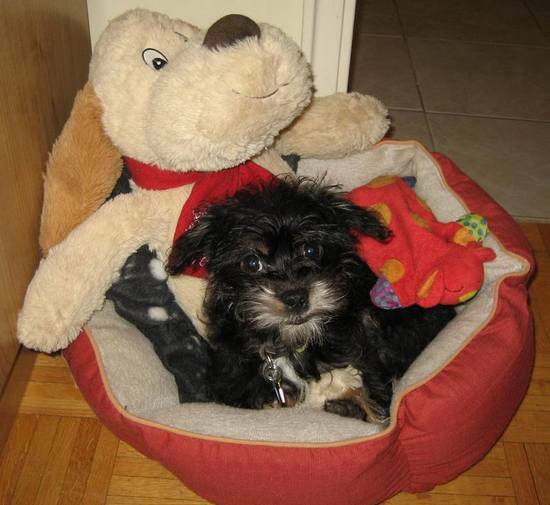 I would love for you to visit my blog at www.colleensquiltingjourney.blogspot.com. 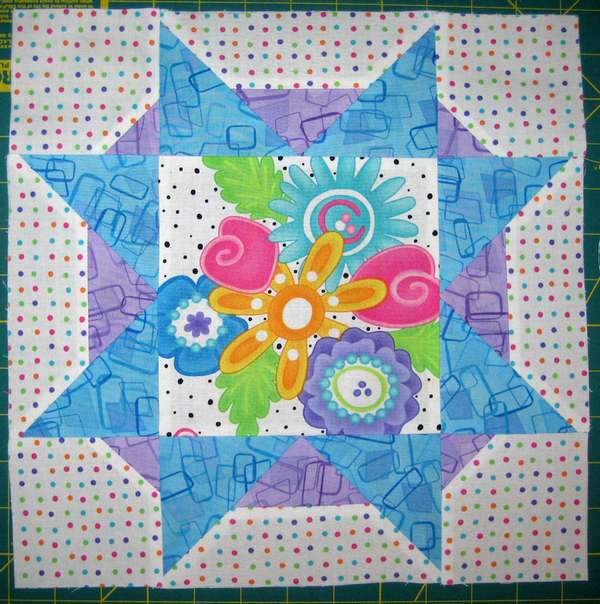 Here's Colleen's block called Easy Spinning Star. Here's my version of Colleen's block. The drawing will be from the flickr group. The drawing tonight (first thing in the morning really) is for any blocks posted since my last block was posted. The drawing is technically for block 7, but any blocks posted will be in the drawing. There will be some of you who are quick and will get your blocks posted. Colleen has donated three charm packs for one lucky winner! And I have two patterns!